Lavery's is Belfast's oldest family run bar and the centre of nightlife in the North of Ireland for over 90 years. With four very different venues under one roof, we promise something for everyone. On the ground floor floor rests the elegant Public Bar (with adjoining Off Licence) and bohemian Back Bar, disabled access to both. The first floor is home to nightclub venue Mister Tom's Lounge, and on the top floor is the Ballroom, Northern Ireland's finest pool hall & best club in Belfast every Saturday night.Food is served daily from midday until 9pm in all bars, The menu has managed to combine Lavery's ethos of wholesome, quality meals across a range of varied dishes. Group bookings are welcome.All major sporting events are shown on big screen plasma TVs with regular associated promotions. Have you got Google Earth on your computer? If so, then download the Google Earth view of Laverys. Is this the wrong position for Laverys? If you think so, then modify its position. Click / Tap the button above to get directions from where you are to Laverys. best place in belfast, bouncers are great, dont take any trouble! back bar is fantastic for chilling, great acoustic sessions through the week, upstairs brilliant for a wee dance on a saturday night! One of the best bars in Belfast. Come as you are and have the craic. Always a good night out. Can not understand why Lavery's is not number 1! By far the best! 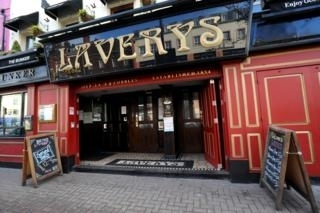 Laverys is an amazing bar with lots of friendly doorstaff and barstaff. 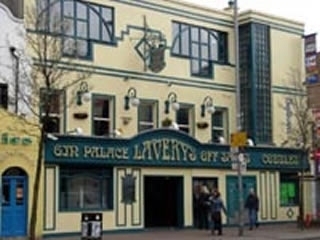 The three floors provide something for everyone, whether its a few pints with the lads or a meal with the missus or even saturday night out, Laverys is the place to be. The top floor provides pool throughout the week and on saturday is turned into a nightclub with great DJ's who will play most requests. It also has a huge smoking area which is always very busy and full of friendly people. The bar on a whole is a great place to be with a great atmosphere, great pints and great food. Solid 9/10. Lavery's has quickly become my favourite place for a night out in Belfast. The door and bar staff, are friendly, there's a great, down to earth crowd and a real mix of music at the weekends. went here on a fri night and it was packed. there was trouble throughout the night.i hadnt been in yrs. the clintelle was lot to be desired as was the bouncers. doormen were extremely rude and unfriendly as were some staff. I now know the reason i stayed away in the first place and this time i wont be back. Terrible place. Never again. We saw about 3 fights in the one night we were there. Most bouncers and management were rude. Toilets dirty and some dodgy clintele. I would not here again for Christmas dinner, it was like a school dinner. Burnt roast potatoes, burnt yorkshire pudding, undercooked ham and gloopy tasteless gravy all over half the plate. Cold noodles for starter. A not very crunchy topped creme brulee. If you like getting packed in like a sardine by all means go at night time at the weekend. Be prepared to wait at the bar and stand all night. Awful toilets. Sticky floor. The best place you can go in belfast on a sat night. you get shuch a good vib from everyone including the staff everyones so friendly and plesent. The legend continues....best bar in Belfast. Have had shedloads of brilliant nights in here....love it. If you want a bar full of people just lettin their hair down and enjoyin themselves, head to Lavery's on a saturday night, the atmostphere's brilliant. Used to hear back reports about this place until I tried it for myself. My cousin recommened it last summer (on a good day), for the beer garden. Had a great night we only meant to stay an hour and ended up stumbling home at closing time. Visited the Back Bar, fell into a company and some have become great friends now. Im here at least once a week. Never judge from what other people tell you, try it for yourself. I did and im sorry i never tried it a little sooner. I went for the first time on Friday night there because my mate was over from Edinburgh for Christmas. We sat in the public bar and it was great craic, bar staff were really quick and friendly. Went back last night and paid a fiver for the 3 rooms thing. I couldn't find the 3rd room but the bunker and the attic were nice, a bit small but still plenty of room. The drink was cheap too! I'd heard bad things about Lavery's but my 2 nights in a row there proved them wrong, I love the place! Excellent for a any occasion! Has something for everyone. The mix of music upstairs is good. The prices are good. Overall, its a great place. Laverys still gets a rough crowd, particularly in the back bar. It's the type of place where you have to watch your back, not a pleasant feeling if you want to have a relaxing night out! Such a shame for a bar which has so much potential. Barstaff were very efficient and friendly. Drinks were relatively cheap... and seemed to have a nice friendlt vibe about the place. Option to listen to some local bands (varying standards). I would say that Lavery's is one of those bars that you wouldn't want to sit down in one place for two long. The beer garden is brilliant craic and just danderin' about talking to whoever you come across is great fun. It just has that atmosphere that so many other bars lack. I have to say though that the doormen can be cheeky sods sometimes, but all in all, they're sound as. Best beer garden in Belfast. I really like Laverys since it has been done up, particularly the once dingey back bar. It has been transformed into a modern disco, playing a real diverse range of music, with free admission, and prompt, friendly service. They've also tightened the door policy, but some scumbags are still managing to get in. Please Laverys get this sorted, because you are doing a great job. It's a great place. I was over from England to see friends and was staying across the road for Laverys. Great food and fine drinks selection. The Friday night was top and though it's not my thing all of the time they run the best Gothic club I've ever been to. Without doubt the best bar in Belfast. No other place offers so much in terms of entertainment, value for money and atmosphere. Each bar has its own feel, but the warm friendly atmosphere is present in each one. Food is excellent and very reasonable. Free entertainment every night in the Back Bar and cracking alternative live gigs in the Bunker. The Public Bar is great for football, and there's 10p off pints for every goal scored. i ahve been once and the door staff were very friendly n i didnt even no them. Haven't been to Lavs for ages then happened to just call in with my mates the other night as I noticed they had been getting a bit of work done. Brilliant refurb of the front & back bars! It looks great & glad they got rid of those awfull toilets. Music was good & the staff were really friendly. Will be back again soon! this is a comfy bar with regular faces and a not bad atmosphere.